In addition to passive roles in structure, lipids also perform active roles in cellular signaling and as coenzymes. Lipids serve as coenzymes in the electron transport chain and in glycosylation reactions. Lipids also function as hormones that transmit signals over long distances and as intracellular messengers responding to extracellular signals. Certain special lipids with conjugated double bonds absorb light, which is extremely important for our ability to see; others act as pigments in plants and animals. Here, we will focus on three important categories of signaling lipids: steroids, prostaglandins, and fat-soluble vitamins, as well as important precursors like terpenes. Remember from Chapter 2 of MCAT Biochemistry Review that a coenzyme is an organic, nonprotein factor bound to an enzyme and required for its normal activity. Before we delve into the details of downstream lipid signaling molecules, we must first turn our attention to terpenes. These odiferous chemicals are the metabolic precursors to steroids and other lipid signaling molecules, and have varied independent functions. 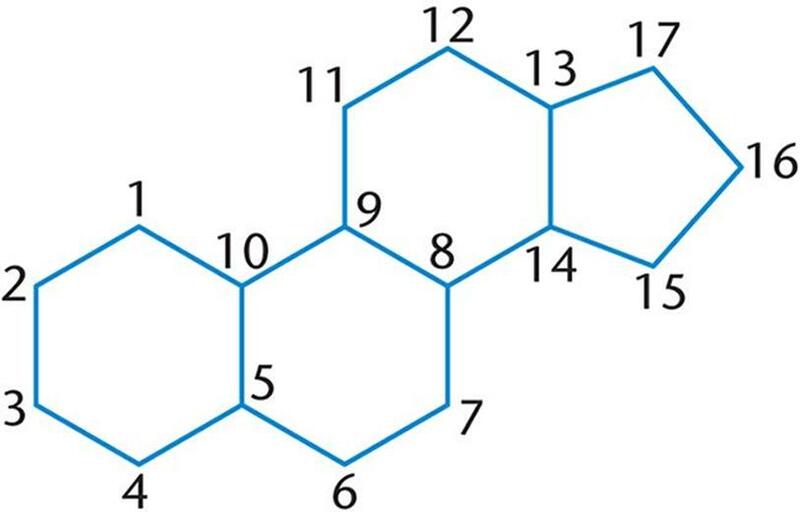 Terpenes are a class of lipids built from isoprene (C5H8) moieties and share a common structural pattern with carbons grouped in multiples of five, as shown in Figure 5.5. Terpenes are produced mainly by plants and also by some insects. They are generally strongly scented. In some cases, these pungent chemicals are part of the plant or insect's protective mechanism. The strong smell of turpentine, a derivative of resin, comes from the monoterpenes that are resin's major components; terpenes actually get their name from their original discovery in turpentine. Terpenes are also the primary components of much more pleasant-smelling essential oils extracted from plants. Terpenes are grouped according to the number of isoprene units present; a single terpene unit contains two isoprene units. Monoterpenes (C10H16), which are abundant in both essential oils and turpentine as described above, contain two isoprene units. Sesquiterpenes (sesqui– meaning one-and-a-half) contain three isoprene units, and diterpenes contain four. Vitamin A, which will be discussed later in this chapter, is a diterpene from which retinal, a visual pigment vital for sight, is derived. Triterpenes, with six isoprene units, can be converted to cholesterol and various steroids, also discussed later in this chapter. Carotenoids, like β-carotene and lutein, are tetraterpenes and have eight isoprene units. 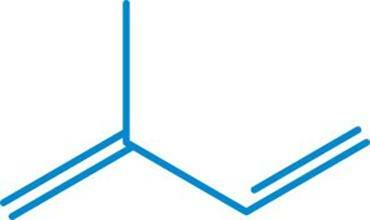 Natural rubber has isoprene chains between 1000 and 5000 units long and is therefore considered a polyterpene. Terpenoids, also sometimes referred to as isoprenoids, are derivatives of terpenes that have undergone oxygenation or rearrangement of the carbon skeleton. These compounds are further modified, as are terpenes, by the addition of an extensive variety of functional groups. Terpenoids share similar characteristics with terpenes in terms of both biological precursor function and aromatic properties, contributing to steroid biosynthesis as well as the scents of cinnamon, eucalyptus, camphor, turmeric, and numerous other compounds. Terpenoids are named in an analogous fashion, with diterpenoids deriving from four isoprene units and so on. Terpenes and terpenoids are precursor molecules that feed into various biosynthesis pathways that produce important products, including steroids, which have widespread effects on biological function, and vitamin A, which is vital to sight. The term steroid probably brings to mind muscle-bound body builders or home run-hitting professional athletes. 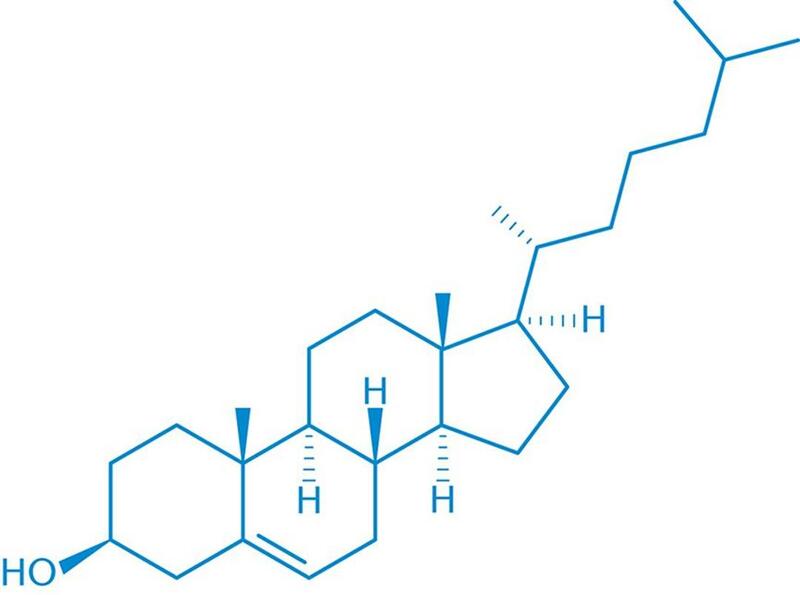 In science, and on the MCAT, steroid refers not just to the infamously abused anabolic steroids, but also to a broader class of molecules defined by their structure. Structurally, steroids, shown in Figure 5.6, are metabolic derivatives of terpenes and are very different from the lipids mentioned earlier in this chapter in both structure and function. Steroids are characterized by having four cycloalkane rings fused together: three cyclohexane and one cyclopentane. Steroid functionality is determined by the oxidation status of these rings, as well as the functional groups they carry. It is important to note that the large number of carbons and hydrogens make steroids nonpolar, like the other lipids mentioned. Keep in mind the terminology difference between steroids and steroid hormones. Steroid refers to a group defined by a particular chemical structure, demonstrated above. Steroid hormones are steroids that act as hormones, meaning that they are secreted by endocrine glands into the bloodstream and then travel on protein carriers to distant sites, where they can bind to specific high-affinity receptors and alter gene expression levels. Steroid hormones are potent biological signals that regulate gene expression and metabolism, affecting a wide variety of biological systems even at low concentrations. Some important steroid hormones include testosterone, various estrogens, cortisol, and aldosterone, which are discussed in Chapter 5 of MCAT Biology Review. Plants, like animals, also use steroids as signaling molecules. Cholesterol, shown in Figure 5.7, is a steroid of primary importance. Cholesterol is a major component of the phospholipid bilayer, and is responsible for mediating membrane fluidity. Cholesterol, like a phospholipid, is an amphipathic molecule containing both hydrophilic and hydrophobic components. Interactions with both the hydrophobic tails and hydrophilic heads of phospholipids, allows cholesterol to maintain relatively constant fluidity in cell membranes. At low temperatures, it keeps the cell membrane from solidifying; at high temperatures, it holds the membrane intact and prevents it from becoming too permeable. Cholesterol also serves as a precursor to many important molecules, including steroid hormones, bile acids, and vitamin D.
Cholesterol can be produced de novo or absorbed from dietary sources. Hypercholesterolemia, or high cholesterol, is a condition that is strongly correlated with heart disease, in which the combination of these two cholesterol sources is excessive. Accumulation of cholesterol in arterial walls results in atherosclerosis, a hardening of the wall. Prostaglandins acquired their name because they were first thought to be produced by the prostate gland, but have since been determined to be produced by almost all cells in the body. These 20-carbon molecules are unsaturated carboxylic acids derived from arachidonic acid and contain one five-carbon ring. They act as paracrine or autocrine hormones. In many tissues, the biological function of prostaglandins is to regulate the synthesis of cyclic adenosine monophosphate (cAMP), which is a ubiquitous intracellular messenger. In turn, cAMP mediates the actions of many other hormones. Downstream effects of prostaglandins include powerful effects on smooth muscle function, influence over the sleep–wake cycle, and the elevation of body temperature associated with fever and pain. Nonsteroidal anti-inflammatory drugs (NSAIDs) like aspirin inhibit the enzyme cyclooxygenase (COX), which aids in the production of prostaglandins. A vitamin is an essential nutrient that cannot be adequately synthesized by the body and therefore must be consumed in the diet. Vitamins are commonly divided into water-soluble and lipid-soluble categories. Lipid-soluble vitamins can accumulate in stored fat, whereas excess water-soluble vitamins are excreted through the urine. The fat-soluble vitamins include A, D, E, and K. Each of these has important and varied functions. Vitamin A, or carotene, is an unsaturated hydrocarbon that is important in vision, growth and development, and immune function. The most significant metabolite of vitamin A is the aldehyde form, retinal, which is a component of the light-sensing molecular system in the human eye.Retinol, the storage form of vitamin A, is also oxidized to retinoic acid, a hormone that regulates gene expression during epithelial development. Vitamin D, or cholecalciferol, can be consumed or formed in a UV-driven reaction in the skin. In the liver and kidneys, vitamin D is converted to calcitriol (1,25-(OH)2D3), the biologically active form of vitamin D. Calcitriol increases calcium and phosphate uptake in the intestines, which promotes bone production. A lack of vitamin D can result in rickets, a condition seen in children and characterized by underdeveloped, curved long bones as well as impeded growth. One way to remember carotene is to remember that carrots are high in vitamin A, which is why eating carrots is colloquially suggested to improve vision. To remember that vitamin D regulates calcium, remember that it is frequently added to milk in order to aid in the absorption of calcium. Vitamin E characterizes a group of closely related lipids called tocopherols and tocotrienols. These are characterized by a substituted aromatic ring with a long isoprenoid side chain and are characteristically hydrophobic. Tocopherols are biological antioxidants. The aromatic ring reacts with free radicals, destroying them. This, in turn, prevents oxidative damage, an important contributor to the development of cancer and aging. Vitamin K is actually a group of compounds, including phylloquinone (K1) and the menaquinones (K2). Vitamin K is vital to the posttranslational modifications required to form prothrombin, an important clotting factor in the blood. The aromatic ring of vitamin K undergoes a cycle of oxidation and reduction during the formation of prothrombin. Vitamin K is also required to introduce calcium-binding sites on several calcium-dependent proteins. Vitamin K is for Koagulation. The anticoagulant warfarin works by blocking the recycling of vitamin K, causing a deficiency or lowering of the active amount of vitamin K. Therefore, patients taking warfarin are recommended to stay away from food containing high amounts of vitamin K, such as green leafy vegetables. 1. How many carbons are in a diterpene? 2. What is the difference between a steroid and a steroid hormone? 3. NSAIDs block prostaglandin production in order to reduce pain and inflammation. What do prostaglandins do to bring about these symptoms? 4. What are the names and functions of the four fat-soluble vitamins?